The Farquhar College of Arts and Sciences welcomed retired U.S. Army General David H. Petraeus, Ph.D., to Nova Southeastern University as part of the college's 2013-2014 Distinguished Speakers Series. Gen. Petraeus served 37 years in the U.S. military, including as commander of coalition forces in Iraq and Afghanistan and as commander of the U.S. Central Command. Following retirement from the military in August 2011, he served for 14 months as the director of the CIA. He is now the chairman of KKR Global Institute, a visiting professor of public policy at CUNY's Macaulay Honors College, a Judge Widney Professor at the University of Southern California and a member of the advisory boards of several veterans' organizations. During his military career, Gen. Petraeus served in Cold War Europe, the United States, Central America, Haiti, Bosnia, Kuwait, Iraq, and Afghanistan. In the decade that followed the 9-11 attacks, he was deployed for nearly seven years, culminating his career with six straight commands, five of which were in combat. Gen. Petraeus commanded the 101st Airborne Division during the fight to Baghdad in 2003 and throughout the first year in Iraq. He returned to Iraq in June 2004 to establish and lead both the Multi-National Security Transition Command-Iraq and the NATO Training Mission-Iraq, completing that tour in September 2005. Gen. Petraeus is most widely known for his role in the subsequent several years. Following his second tour in Iraq, he oversaw the U.S. Army's preparation of leaders and units for deployment to Iraq and Afghanistan, including guiding the development of the Army/Marine Corps field manual on counterinsurgency. He then returned to Iraq to command the surge and guide the implementation of the counterinsurgency manual's concepts. During his time at the helm of the Multi-National Force-Iraq, violence was reduced by 90%, Iraqi forces were reformed and expanded, and transition of tasks to Iraqi forces was commenced. After returning from Iraq, Gen. Petraeus took command of the U.S. Central Command, overseeing the operations of all U.S. forces in the Middle East and Central and South Asia. In early July 2010, he deployed again, this time to command the NATO International Security Assistance Force and U.S. forces in Afghanistan. 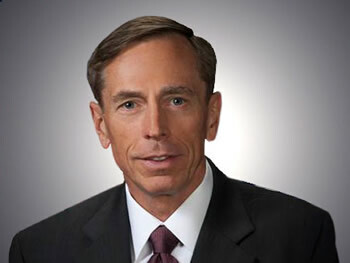 Following retirement from the military, Gen. Petraeus served as the director of the CIA, leading the agency during a period that saw significant achievements in the global counterterrorism effort, initiation of a comprehensive strategic plan to guide the agency, conduct of an effort to increase worldwide intelligence coverage, establishment of the Economic Security Center, and commencement of a number of initiatives to increase the agency's investments in its human capital. Gen. Petraeus graduated with distinction from the U.S. Military Academy, was the General George C. Marshall Award winner as the top graduate of the U.S. Army Command and General Staff College Class of 1983, and subsequently earned M.P.A. and Ph.D. degrees in international relations from Princeton University's Woodrow Wilson School of Public and International Affairs. He later taught international relations and economics as an assistant professor at the U.S. Military Academy and completed a fellowship at Georgetown University's Institute for the Study of Diplomacy. He has received numerous U.S. military, State Department, NATO, and United Nations awards and decorations. He also has been decorated by 12 foreign countries. As part of the college mission to prepare students for rich professional careers and active citizenship, the college frames co-curricular programs and experiences around a broad annual academic theme that unites our community in interdisciplinary exploration. The academic theme for the 2013-2014 school year is "Good and Evil." Petraeus spoke on this theme. For more information on the Distinguished Speakers Series, contact the Office of the Dean at (954) 262-8236.